USPS Returns uses recent mail processing equipment upgrades to streamline package weighing, measuring, scanning and payment calculations. 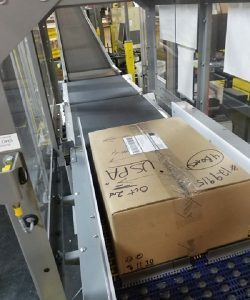 The Postal Service has implemented USPS Returns for business mailers, the first phase of a new package platform for automating postage assessment, sampling and payment.USPS Returns uses recent mail processing equipment upgrades to streamline package weighing, measuring, scanning and payment calculations. The platform also allows customers to be charged electronically through their Enterprise Payment System accounts, expediting the secure payment process. USPS Returns is replacing the manual postage payment steps for Merchandise Return Service, scan-based payment for returns, and scan-weigh-pay package return processes. “The new technology brings more simplicity, efficiency and transparency for the customer than ever before,” said Marc McCrery, acting mail entry and payment technology vice president at Postal Service headquarters in Washington, DC. The platform is part of the Postal Service’s efforts to capture a greater share of the package market, which processes 14.4 billion parcels per year and boasts $89 billion in annual revenue. The platform fits with two core USPS strategies: to innovate and to invest in the future. The next phase of the implementation will shift outbound parcels onto the platform, beginning later this year. This entry was posted in General Union Business and tagged automated returns, automation, mail processing equipment upgrades, package market, package processing, Parcel Return Service, USPS Returns. Bookmark the permalink.